About 24 kilometers away from Shannon International Airport, Limerick (third city of the Irish Republic) is made up of the older district of English Town to the north, at the junction of the Shannon and Abbey rivers, and two districts to the south of the Abbey River, Irish Town and Newtown Pery. Generally speaking, Newtown Pery is the more upmarket area as well as the business and banking quarter with O'Connell Street as the principal thoroughfare. In this street and in Mallow Street, which branches off it, are some attractive Georgian buildings. Interestingly, the famous 'limerick' poems didn't necessarily originate in the city, but were probably first conceived in England. As well as taking in the city's must-see attractions, visitors should see the surrounding Shannon area with such gems as picturesque Adare village and medieval Bunratty Castle. Starting from Sarsfield Bridge, a leisurely 15-minute walk takes visitors to King John's Castle, arguably the city's most photographed attraction. 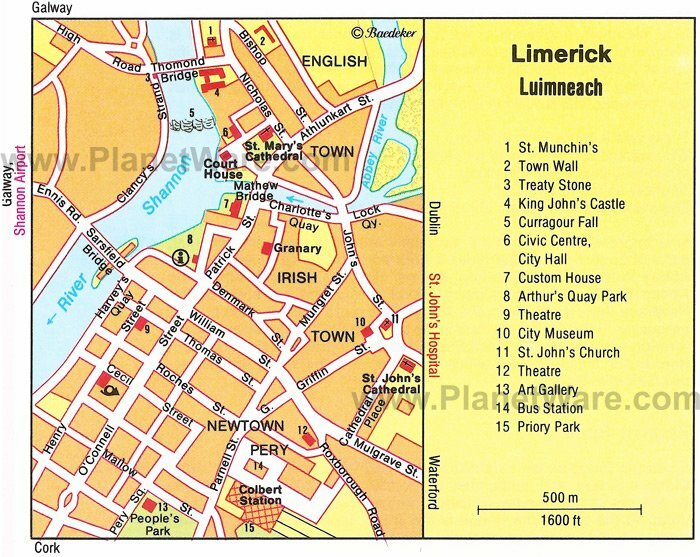 En-route, with short detours, are the Hunt and Limerick City Museums. The 13th-century castle stands to the right of Thomond Bridge and rises imposingly above the Shannon. The pentagonal fortress, with a main block, three round corner towers, a bastion, and a two-story gatehouse has been thoroughly restored and is the historic jewel in Limerick's crown. Parts of the complex now serve as exhibition rooms. The history of Ireland and Limerick are brought to life by means of reconstructed scenes. In addition there's a video display, information about the excavation of Viking houses, defensive works, and siege tunnels. St. Mary's Cathedral is one of Ireland's secluded jewels. A place of worship has occupied this site since 1168. The West Doorway (originally the entrance to the former Royal Palace) dates from the 12th century and it's claimed that marks on the surrounding stonework were made by defenders of the city sharpening their swords during various sieges. This door is now only used during ceremonial occasions when those wishing to enter must knock first before entry is granted. A stroll through the interior takes visitors through a timeline dating from the early medieval ages to the present day. The vaulted roof, gothic stained glass windows, medieval floor tiles, and elaborately carved 17th-century choir stalls and marble tombs all bear witness to a tumultuous past. About a 10-minute walk from St. Mary's Cathedral, St. John's Square consists of ten fine stone-faced Georgian townhouses dating from around 1750. The houses fell into serious decay over the centuries, and by the 1970s were derelict and ready to be demolished. Thankfully this didn't happen due to a combination of private and public funding. Recently, a further one million euros was spent upgrading the location. Adjacent, early-gothic St. John's Cathedral (named after St. John the Baptist who is said to have a connection to the city through the Knights Templar) boasts the highest church spire in Ireland. The Limerick City Gallery of Art is housed in the 1906 Romanesque Carnegie Building. The building was funded by philanthropist Andrew Carnegie (1835-1919) and was originally called The Carnegie Free Library and Museum. It's now one of Ireland's leading contemporary art galleries and displays an impressive collection of Irish 18th to 21st century art. The gallery is also home to the Michael O'Connor International Poster Collection and the National Collection of Contemporary Drawing. Adjacent to the gallery is People's Park on Georgian-styled Pery Square. Beside the Limerick City Gallery of Art, People's Park, dating from 1877, is a tranquil oasis and the city's main green space. A large selection of mature deciduous and evergreen trees dot the park and, during the spring and summer, visitors can admire a wonderful display of flowers. Other features include a memorial on a giant pillar to Thomas Spring-Rice (MP for Limerick 1820-1832), a 19th-century bandstand, an ornate drinking fountain, and two gazebos. Under half-an-hours' drive from Limerick city (R445/R506) brings visitors to beautiful Benedictine Glenstal Abbey set on a serene 500-acre estate. Day visitors are welcome to visit the grounds and the church, and those who wish can attend the liturgy. Scenic walks meander around the grounds, which are adorned with beautiful trees and flowers and provide a sanctuary for wildlife. The remains of Ireland's old oak forest lie along the perimeter. It should be noted that the school buildings and playing fields are not normally open to the public. Visitors can browse the wide range of books and souvenirs in the gift shop (generally open daily 9.00am-5pm). Around 26 kilometers from Glenstal at Holy Cross on bow-shaped Lough Gur, this prehistoric site is a National Monument of exceptional interest. The Heritage Centre re- opened in June 2013 after a facelift and now boasts state-of-the-art facilities. Visitors can explore the fascinating heritage of Lough Gur through interactive multimedia displays covering more than 6,000 years of archaeology and history. During the 19th century, the lough was partly drained and evidence of occupation going back to the Neolithic period was found. Notable features include a wedge-shaped passage grave, stone forts, a Neolithic burial site, a burial mound with a circle of standing stones, a fine double stone circle, a crannog (an artificial islet now linked to the shore), and a cult site with an almost monumental entrance. There are also two medieval structures, 16th-century Bourchier's Castle and 14th-century Black Castle in addition to a ruined 17th-century church. A 25 kilometer drive from Lough Gur (R512/511) lies quaint Adare village and magnificent Adare Manor. The village hugs the wooded west bank of the River Maigue on the busy road leading to Killarney. With its thatched roofs and old grey-walled church, it has something of the air of an English hamlet. The arched stone bridge gives an attractive view of the beautifully planted banks of the river and old buildings in the background. Presiding over a park, the 1832 neo-Gothic mansion, Adare Manor, was transformed into a luxury hotel some years ago. The principal rooms, including the hall and picture gallery, are open to the public. The Tea Room affords pleasant views of the gardens and terraces. On the banks of the river that runs through the park are the ruins of 13th-century Desmond Castle, a beautiful sight with its round towers and vine-draped walls. About a 40-minute drive from Adare, Foynes Flying Boat Museum is a must-see for aviation and 20th century history enthusiasts. Housed in the old Foynes terminal building, this is where flying boats would make their post Atlantic stopovers. There's a comprehensive range of exhibits and graphic illustrations including a Radio and Weather Room, an authentic 1940s cinema, and a full sized replica B314 flying boat. Budding aviators can practise on one of the flight simulators. Just over 15-minutes' drive from Limerick city (N18/E20) is one of Ireland's most renowned and fun attractions, the much-loved Bunratty Castle. No visit to the Shannon region would be complete without coming here. Dating from 1425, the castle is the most complete and best-preserved medieval fortress in Ireland and was restored in 1954 to its former glory. It now contains mainly 15th- and 16th-century furnishings, tapestries, and works of art instilling a mood of distant medieval times. Intrepid souls can attend evening medieval banquets during which certain guests may be banished to the dungeons below. The Folk Park is a recreation of how Ireland was more than a century ago. Occupying 26 rural acres, the park encompasses more than 30 buildings in a 'living' village. Farmhouses, village shops, and streets are recreated and furnished as they would have appeared at that time according to their social standing, from the poorest one-room dwelling to Bunratty House (1804). This impressive Georgian residence was once home to gentry and the Studdarts, the last family to occupy Bunratty Castle. The half-acre walled kitchen garden is a particular treat. No. 1 Pery Square Hotel & Spa: luxury boutique hotel, Georgian quarter, period-style rooms, wonderful day spa, afternoon tea. Absolute Hotel: mid-range pricing, riverside location, contemporary decor, great-value dining. Limerick Strand Hotel: affordable rates, just across a bridge from the city, beautiful river views, leisure center with multiple pools. The George Limerick: value boutique hotel, friendly staff, great restaurant, air-conditioned rooms.